AI simply has to be part of the fabric of any modern app from this point forward. It makes sense to work with existing best-in-class AI services instead of trying to invent them yourself, so it’s tremendous that AWS makes them available for us to just plug into. Astro enables workplace teams to focus on what’s most important by using machine learning to make their communications more effective. Founded in 2015 and based in Palo Alto, California, the company raised $10 million in its Series A venture-capital round. Despite frequent predictions of its imminent death, email isn’t going anywhere. By the end of 2021, there are expected to be more than 4.1 billion worldwide email users sending and receiving about 320 billion emails a day. This volume of email has the potential to cause inbox overload, and, therefore, decreased productivity. Current technology solutions include email apps with an increasing number of sophisticated features, and non-email communication apps that aspire to replace email altogether. Astro, a startup software development company founded in 2015 and headquartered in Palo Alto, California, approaches this problem a bit differently. The company believes that artificial intelligence (AI) and deep-learning technologies like Amazon Lex in the Amazon Web Services (AWS) Cloud can solve the problem of information overload. 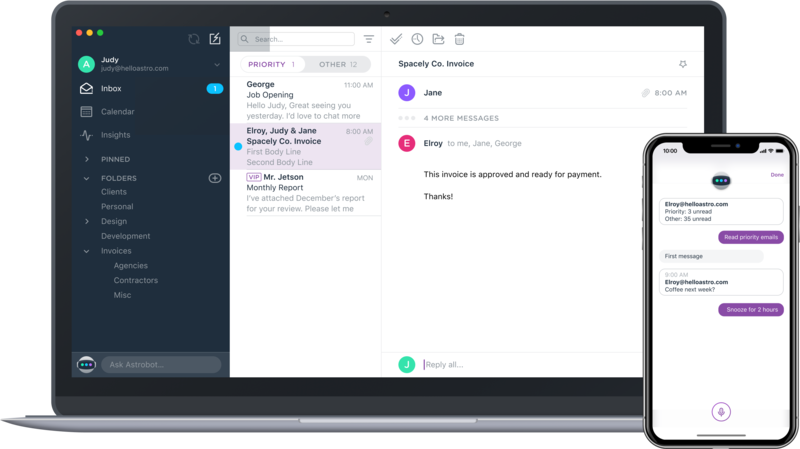 Astro sees immense potential value for email users, hidden right in their inboxes. “Our email accounts hold a massive quantity of untapped—and potentially extremely valuable—unstructured data and workplace information,” says Andy Pflaum, Astro chief executive officer and cofounder. When Astro released the first version of its Astro email app in early 2017, it shipped with Astrobot, an in-app chatbot assistant. Astrobot uses machine learning and natural-language processing to take on some of that “cognitive overhead” of managing busy inboxes. Within 30 seconds of first syncing with users’ accounts and emails, Astrobot pulls insights and suggested actions such as unsubscribing from lists, automatically archiving certain messages, and highlighting important questions and due dates. Users can also ask Astrobot to set reminders, answer questions, and distinguish VIPs from less important contacts. Astrobot debuted with a text-only interface, but Astro quickly added an Alexa skill that gave users the option of interacting with the service through voice commands over the Amazon Echo family of devices. 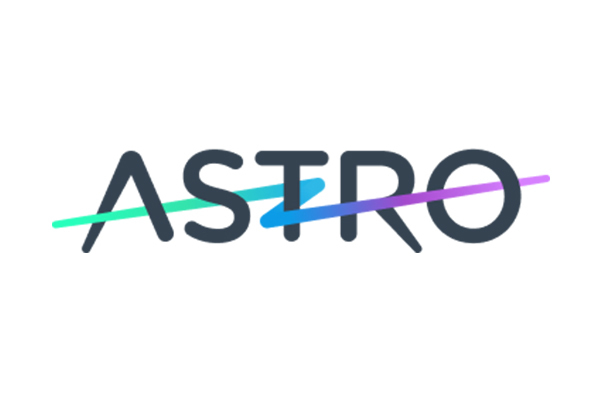 Astro decided that the next logical step in the service’s evolution would be to offer voice-based email management inside the Astro app itself. Astrobot customers seem to be excited about the new capability, too. “We saw a 250 percent increase in web sessions on the day we launched Astrobot Voice and acquired three times more new users in the first week, compared to the previous week,” says Pflaum, adding that more than a third of Astrobot users tried Astrobot Voice on the very first day it was available. For a startup like Astro to achieve so much, so quickly, it needs IT infrastructure and services that are simple, flexible, and powerful enough to let the company’s lean teams focus on code, products, and building value. That’s why Astro was born in the AWS Cloud and relies on AWS services for its Astro email app and Astrobot Voice. At the heart of Astrobot Voice is Amazon Lex, which uses natural-language processing to provide high-quality capabilities for speech recognition and language understanding. With these capabilities, developers can build sophisticated chatbots inside existing applications. The Astro email app also relies on Amazon Aurora to store message and account metadata and uses Amazon Simple Storage Service (Amazon S3) to hold message content and attachments. Astrobot Voice currently uses on-device speech output, but Astro plans to replace that soon with Amazon Polly, an API-driven service that uses advanced deep-learning technologies to synthesize speech and that will convert the solution’s output strings into natural-sounding speech interactions with Astro users. Although some companies are still wondering whether and how AI and deep learning can be useful to them, Pflaum is convinced these technologies are already crucial and will soon be ubiquitous. “AI simply has to be part of the fabric of any modern app from this point forward,” he says, comparing deep-learning technologies to earlier basic underpinnings of modern software development, like databases or internet connectivity. 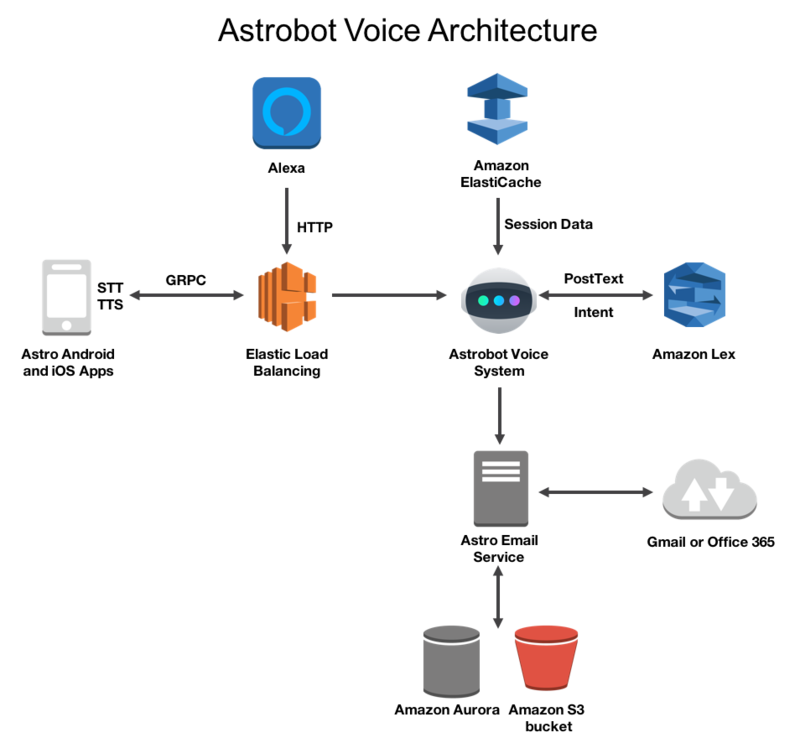 “It makes sense to work with existing best-in-class AI services instead of trying to invent them yourself, so it’s tremendous that AWS makes them available for us to just plug into." Learn more about conversational interfaces powered by Amazon Lex.